I just brought my 08 335 convertible in to get the hardtop roof repaired. It does'nt meet evenly on to the windshield,[ driver's side is up higher than the passenger when you attempt to close the roof] So far, they don't know the cause. Any suggestions?? Help would greatly be appreciated. Thanks! I suspect a minor adjustment. It may be that the dealer just doesn't yet have much familiarity with retractable hard-top repairs. I'm sure they've had a tech at school for it but probably haven't had much opportunity for hands-on experience. If they can't get it sorted out they'll get help from BMW or maybe even a visit from the regional technical field team. I'm sure they'll get you straight. What a great car you got! Two of my BMW convertibles turn 38-years-old this year, two turn 44, and one will be 51. Seems like only yesterday . . . Thanks for the reply. You're probably right, and yes, it is a fantastic car. Sometimes it's easy to get a little paranoid when you read about other's people's problems with the new conv. roof .Nice picture! !.., although I'm not sure of the model ..thanks again. Make sure you document every time you take your car in. The roof not fitting properly seems to be a hard thing to miss. Do you think the problem happened in transit? Nice picture! !.., although I'm not sure of the model ..thanks again. 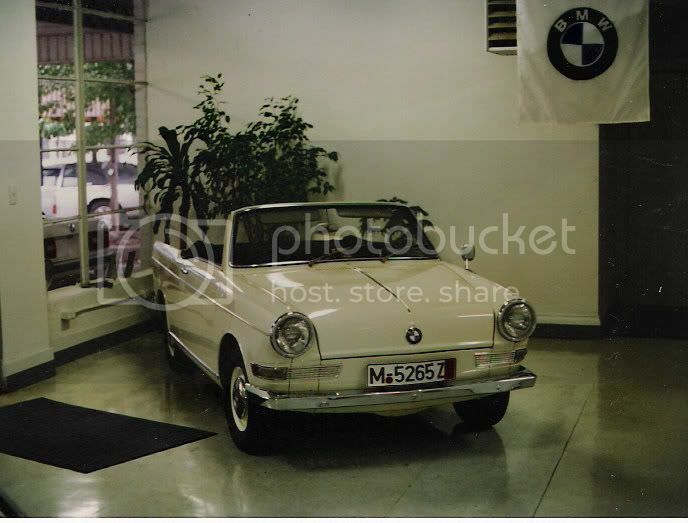 It's a 1964 BMW 700S Cabriolet. A Michelotti design. The 700 is the car that saved BMW. Long story but believe me you owe the very existence of BMW today as an independent vehicle manufacturer to the success of the 700.
see ya in the left lane.